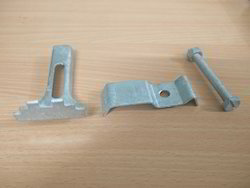 This Galvanize grating clip set - E type is available in Hot dip galvanize finish. Also available in SS 316 or SS 304 Material. 12/16 & 19 mm packaging galvanized clips are use full to maintain packing quality during transport anywhere in the world. Galvanized Packing Clip is superior in quality and supplied in market in various sizes and shapes. These packing clips are compact in size and meet exact requirement of patrons.